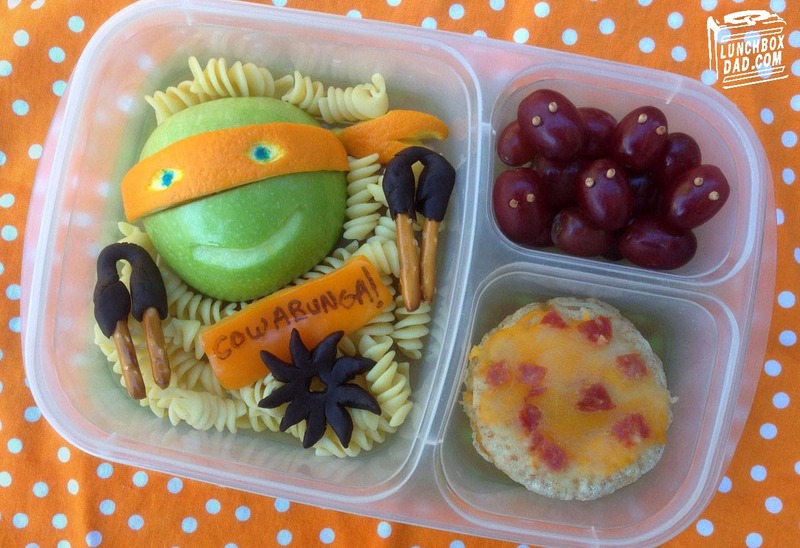 Lunchbox Dad: Teenage Mutant Ninja Turtles Lunch and HUGE Giveaway! 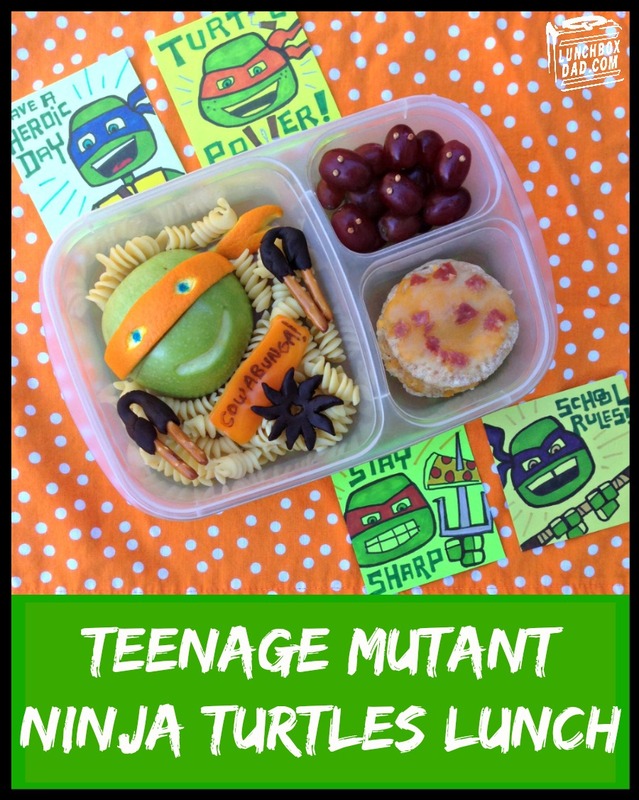 Teenage Mutant Ninja Turtles Lunch and HUGE Giveaway! One of my favorite cartoons from the 80's was definitely Teenage Mutant Ninja Turtles. I also had a ton of the toys. My favorite was actually Donatello because I loved his smarts and his bow staff he used as a weapon. My kids are now starting to catch Ninja Turtle fever so I decided it was time for a lunch! 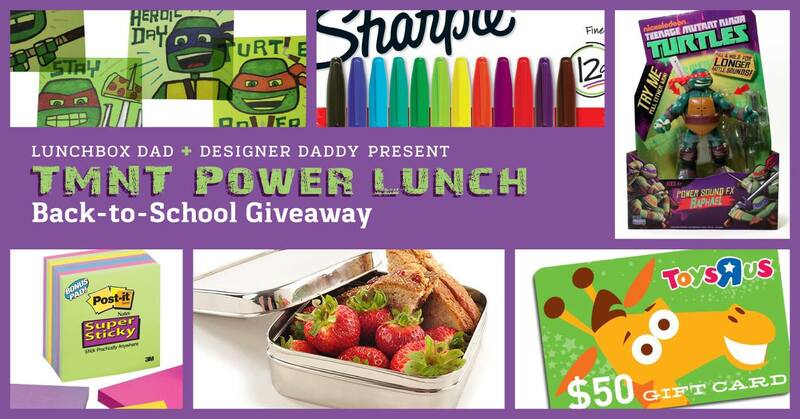 Plus, Designer Daddy (who also does Super Lunch Notes) partnered with me for the lunch and an amazing giveaway. 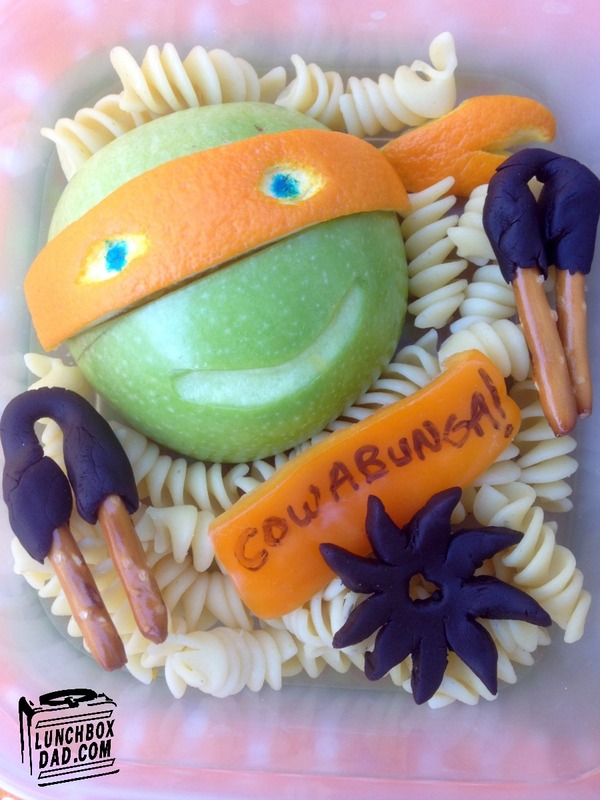 He drew four awesome TMNT lunch notes to go with this lunch. You can check out his talent on designerdaddy.com and on Instagram HERE. If you enter our huge TMNT Power Lunch Back-to-School Giveaway you can win a $50 gift card to Toys-R-Us, 4 Designer Daddy hand-drawn TMNT lunch notes, a TMNT action figure, an Eco Lunchbox Solo Cube, and Sharpies and Post-It Notes to make your own lunch notes! Just use the Rafflecopter widget below. You don't want to miss this prize pack! Here are the directions for my TMNT lunch. It really is pretty simple, plus my kids love the mini whole wheat pizzas. I made it in an Easy Lunch Boxes container with a Funkins reusable napkin as the background. 1. Cut apple in half and slice wedge from one half. Cut matching sized wedge out of orange. Put orange wedge inside apple where you cut the apple wedge from. Make shallow cuts for the eyes and mouth and peel off apple and orange skin. Use a little blue food coloring on the orange peel for his eyes. 2. Cut second piece from orange and trip to shape of mask "tail." Also rub orange juice on apple to prevent browning. 3. In main dish place head and mask "tail." Pack pasta around turtle so it doesn't move. Break pretzel sticks in half and mold modeling dough around each piece as shown for Michelangelo's nunchucks. Mold ninja star for an added effect. Place nunchucks and ninja star in main dish. You can also write "Cowabunga" on black food coloring on sweet pepper or orange peel. This is his catch phrase. 4. In side dish place grapes. For a few of the grapes push toothpick pieces though for eyes and put them on top of the pile. These reminded me of the original footsoldiers from the 80's cartoon. 5. Cut mini pita pockets in half and sprinkle on cheese. Cut one piece of pepperoni in tiny pieces and place on top of cheese. Heat up in microwave for a few seconds. Once they are cool, place mini pizzas in second side dish. The perfect match for my boys TMNT back packs! Keep up the great work guys. My son likes Leonardo because he wears his favorite color blue mask and because he is brave. My daughter loves TMNTs! And she loves her homemade lunches every day. My daughter is not really aware of TMNT yet, but I grew up with it and hope to introduce her to the characters. My boy LOVES TMNT!! Those notes are amazing. Leo was my favorite since he has two swords! Awesome Giveaway! Michelangelo because he provides comic relief! Leonardo, cause hes the leader and hes got swords! I like Donatello because almost anything can be his weapon. Donatello because he is the smartest. My oldest likes Donatello because he is the "science one", my middle likes Mikey because he loves pizza, and my youngest like Raphael because he is tough and has a red mask. Leonardo is my kids favorite, but he was mine when I was younger! Oh my! My ninja turtles-obsessed little man would absolutely love it. Fab!